NEWPORT NEWS, Va., April 11, 2006 (PRIMEZONE) -- Northrop Grumman Corporation (NYSE:NOC) has been awarded a contract from the U.S. Navy for maintenance work on the nuclear-powered submarine USS Oklahoma City (SSN 723). Northrop Grumman's Newport News sector is the prime contractor for the work, which will include inspection and repair of the submarine's hull, sail, tanks and torpedo systems, as well as modifications to engine room equipment. The contract is valued at approximately $15 million and is a modification to a contract awarded in 2004 for initial planning work. The total estimated value of that contract, including the planning and execution, is approximately $21.5 million. "We have an outstanding team and we have performed well on both submarine and carrier maintenance contracts," said Irwin F. Edenzon, vice president of technology development and fleet support at Northrop Grumman Newport News. "This is important work and we are focused on getting Oklahoma City back to the fleet as quickly as possible." The ship arrived at the Newport News sector on April 10 for a performance period to last approximately two months. Approximately 300 employees will work on the project. 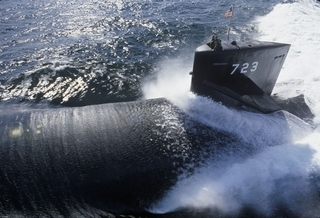 As one of only two U.S. shipyards capable of building nuclear-powered submarines, Northrop Grumman Newport News has built 25 of the Navy's Los Angeles-class submarines in use today, including the USS Oklahoma City (SSN 723). Oklahoma City was launched in 1985 and delivered to the Navy in 1988. At 360 feet in length, it can travel in excess of 20 knots.